Enjoy this Free Quilt Pattern in Honor of Mother's Day! In honor of Mother's Day, I wanted to share with all of you this free Quilt Pattern. It's been my go to quilt to make when I want to make something special for friends and family, but don't have much time as it comes together quickly! To receive the pattern, simply sign-up for my newsletter below. Cheers y'all! 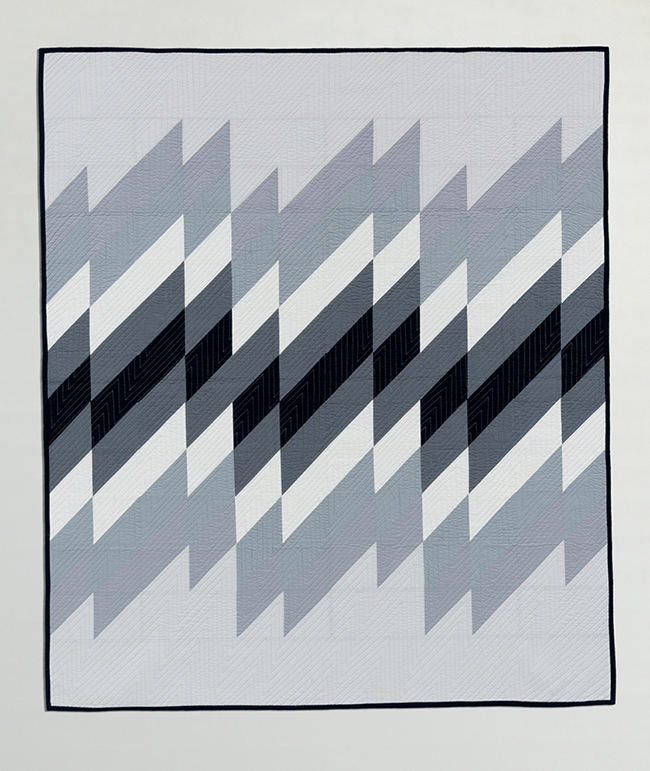 Sign up with your email to receive the Free Squared Quilt Pattern! Southwest Modern Blog Hop and Giveaway Time Y'all! I am so excited to announce the Southwest Modern Blog Hop today. Below is a great lineup of quilters (and friends) who are going to share his/her favorite project from the book. Be sure to follow along each day for a chance to win a copy of Southwest Modern! To enter the grand prize giveaway, simply sign up for the newsletter below. For an extra chance to win, be sure to comment/like on my giveaway post on instagram. Winner will be announced at end of day on March 18th! Click here to purchase your autographed copy of Southwest Modern. I'm so happy to be part of the Modern Quilt Guild blog tour of their gorgeous new book, Modern Quilts: Designs of the New Century, featuring thirty-two contributors and over 200 color photos of modern quilts. Have to be honest, I totally did a happy dance in the studio when I found out the MQG wanted to feature the Migration Quilt in the book, page 169. When I originally designed the quilt, my main goal was to master the flying geese piecing method and I loved how it all came together with the subtle shift of solids from light to dark. Y'all know how much I love my white space, right? Please be sure to check out all the fabulous designers who are part of the blog tour below and grab your own copy of the book here as 100% of the royalties earned from the book go to the Modern Quilt Guild, a 501(c)3 non-profit organization. Cheers y'all! No longer am I second guessing the placement of my stitches while quilting nor do I strain my eyes while re-threading my needle on my sewing machine. Quilting deadlines are finishing ahead of schedule, and suddenly I have extra time to focus on designing new quilt patterns for future projects. Which leads me to the Luminos lamp. Picking out color is my favorite process of the design stage. Weather used to play a big factor in my lack of productivity (especially in the middle of a deadline) as I relied heavily on the natural light in the studio when selecting the right colors for a new project. 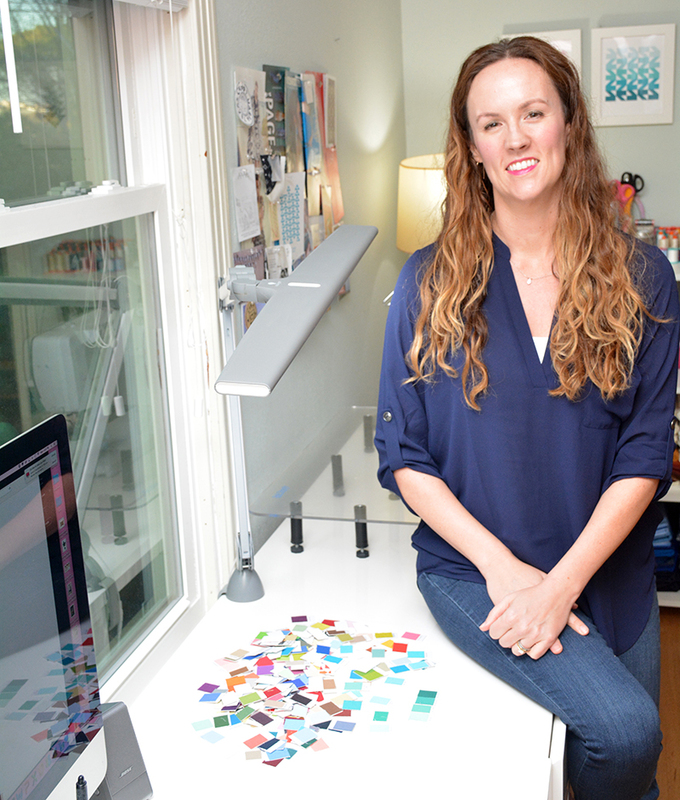 As a designer, color is key is my world and the Luminos lamp has been an absolute lifesaver as I no longer have to worry about the weather and/or lack of natural light in the studio. No matter the time of day, I simply turn on the lamp, get to work and move forward confidently in selecting colors for various projects. The best bonus is that I have endless light for taking high resolution photos to post on social media, because we all now how important it is to create engaging content for our followers, right? Again, another win in my book hands down. So if you’re looking to become more productive in your daily sewing activities, the Daylight products are an excellent addition to any studio. I promise you’ll be surprised with the extra time you’ll have on your hands once implementing the products. I certainly was! Which leads me to announce how proud I am to be a 2018 brand ambassador for the Daylight Company. For more information visit The Daylight Company and use the code InitialKStudio18 to receive 20% off your order. Southwest Modern launched at Quilt Market and I had a wonderful time presenting the full promo video during my School House session as well as having my first book signing at the Lucky Spool Media Booth. It was an absolute treat to finally have the book in hand and I'm so proud to finally share the full video (created by the talented Paula of Sister Wolf) with all of you! I'm happy to say shipments are going out to quilt shops as we speak, so please keep an eye out for them. Otherwise, the book is available for pre-order via Amazon and I should be receiving my own shipment of books soon. If you'd like for your local quilt shop to carry the book, please have them contact me directly via email. Welcome to the Fall Block Party y’all! Fall is my absolute favorite time of year and I’m so excited to kick off this sew-a-long with the Fall Geese blocks – a beginner friendly paper piece Half-Rectangle Triangle quilt block. This quilt block is suitable for the beginner quilter with basic knowledge of paper piecing. For those of you new to paper piecing, rest easy as the pattern has step-by-step instructions on how to make your own HRT block. I decided to go with a yummy fall color palette that is inspired by the fall foliage found throughout the Southwest in October. I had the chance to test out my new Day Light Company lightbox and I have to say, it made a world of difference when aligning the fabric with the paper piece template and was small enough to fit on sewing table while piecing. Win win in my book! The size of the lightbox was ideal as well as it fit perfectly next to my sewing machine. There are a variety of ways to layout this quilt block to achieve different looks. I decided to turn my quilt block into a table runner and now I can’t wait to host my next dinner party. Come to think of it, this would make a great hostesses gift right? Regardless, the table runner came together in no time at all y'all. Head on over to fabric.com blog to download the pattern! Be sure to follow along with the rest of the designers below. Happy Fall Block Party Sew-a-long y'all! Yesterday, August 13th marks the three year anniversary of launching Initial K Studio. To say time has flown by in an understatement. To celebrate, all quilt patterns and art prints are 20% off for the week. Cheers y'all! I am so happy to announce the release of Rock Solid, published by Martingale and features 13 quilts made with Kona cotton solids. I was so excited to be part of this collaborative book and had so much fun designing Ragged Edges. To celebrate the book's release, head on over to Martingale's bloghttp://blog.shopmartingale.com/ to be part of their book giveaway! Be sure to visit @Martingaletpp and @RobertKaufman on instagram for more giveaway goodies. Happy Wednesday y'all. It's Summer time y'all and I'm so excited to be part of the Summer Block Party hosted by fabric.com. When I was asked to be part of this shin dig, I knew exactly what I wanted to make - a nautical stripes block in ode to my childhood summer's spent on the South Texas coast, tagging along on fishing trips with my brother and father. My first flounder (age 6) followed by my first dorado caught at age 8! What exactly is the Summer Block Party? Twice a week for the next four weeks, one quilt pattern designer will share his/her summer block. All the blocks are 12″ finished - the perfect size for a pillow, mini wall hanging or quilt! I decided to turn my quilt block into a pillow to compliment my nephew's nautical themed room for his second birthday. The love for the sea runs deep in our family y'all! This quilt block came together in no time at all and now I'm tempted to turn this into a quilt. The design and color combinations are endless. The awesome peeps over at fabric.com are working on building a free block library, and I'm honored to be part of the inaugural Summer block party. To download the pattern for the Nautical Stripes quilt block, click here! Be sure to follow along as the weeks continue for the additional quilt blocks. June 5 - “Candied Pineapple"
June 8 - “Nautical Stripes"
June 12 - “Camp Out"
June 22 - “Popsicle Party"
June 26 - “Sunshine Days"
June 29 - “Fishy Fish"
July 5 - “Half Square Gingham"
Introducing my first book, Southwest Modern, published by Lucky Spool Media, and will be available starting September 2017. Part travel guide, part sewing book, this book encompasses my love for travel, design and adventure and features 18 travel-inspired quilts designed by yours truly and shot on location in the beautiful Southwest. This has been a huge passion project of mine for the past year and I am so happy to finally share it with all of you, including this behind the scenes video produced by Sisterwolf. More details will be released in the upcoming months, and if you want to be the first to know, be sure to sign up for my newsletter at the link below. In the meantime, the book is available for pre-order on Amazon. For those of you who are early-bird purchasers, please save your proof of purchase/receipt as I will be sending out a special “thank you” closer to the release date! Big thanks to my friends and family this past year for all of your support, love and laughter. Special shout-out to my fabulous photographer, past co-worker and friend Kurt Griesbach. You’re the best photographer and road trip friend a gal could ask for and I loved working with you while traversing through West Texas and New Mexico. It's been quite a while since I've ventured onto the blog. This past year has been filled with lots of life changes, including relocating to Austin this past summer. Needless to say the move coincided with a big work project (more about that later) and I'm finally coming up for air in the blogging world. So hi guys! On to the fun stuff - The 100 day project. If you're not familiar with it, it was started by Elle Luna a few years ago and focuses on the process of 100 days of making and I decided to finally participate this year on a whim after wrapping up my big deadline a few weeks ago. Rather than focus on sewing related project, I decided it was best to change things up with sketching instead. I love the freedom of it so far, although I'm terrified I'm going to run out of ideas. But then again, that's the whole point of the project right? Regardless, I hope you join me over on instagram for the daily journey. Cheers y'all! So excited to announce my newest quilt pattern, Fly By! Designed exclusively for Stash Builder Box July subscription. You can sign up to receive the box on their site now through July 14th. Pattern includes two sizes- baby and throw size- and four color-way suggestions. Cheers y'all! Am so excited to share with y'all this commissioned twin size Cascade Quilt for a little boys room. The client requested a blue/grey ombre color-way but with more blue and less grey. We worked together until we had a color-way that we liked. Custom monogrammed initials were included on the bottom as well. Perfect detail for an heirloom quilt. Happy Monday y'all! So excited to share this Arrowhead Quilt, sewn with Me+You Indah batiks and solids. The fabric is an absolute dream to work with and loved integrating the batiks and solids with the Arrowhead quilt. Am so thrilled to participate in the What Shade Are You Blog Hop with RJR Fabrics. With springtime’s arrival, I wanted to create something bright and fun to reflect the warmer weather and sunshine as well as challenge myself with a minimal quilt block design. Thus the Mini RJR Springtime Quilt! For the front I used the following solids: Beach Coral (355), Chili Pepper (49 T), Bougainvillea (361) and Kerchief (364 C+S). For the back I used Cotton+Steel 2015 Penny Arcade line by Kimberly Kight – it was a perfect fit with the solids. Overall, I really loved working with the fabric! The solids were a dream to sew with and I loved how quickly the mini came together! Head on over to instagram for a chance to win this 1/2 yard bundle! Happy Friday y'all! It's been a labor of love over the past few months, but I'm so excited to announce that the Migration and Modern Waves Quilt pattern are finally ready for release! Both patterns are available in three color-ways and three sizes (baby, throw and queen). The patterns will be available for purchase here as a bundle for $20 till Sunday, but come Monday, they'll be available for $12 each. Thank you so much for all the kind words and compliments about Shannon's debut collection and my mini Arrowhead quilt. The randomly chosen winner is Linda Douglas! Congrats Linda - just sent you an email! I am so excited to be the final stop of the Dryad Blog Hop + Giveaway with Shannon Brinkley and Fabri-Quilt! I had the chance to meet Shannon while at Quilt Market this past October and fell in love with her scrappy applique mini's that were displayed in her booth. Seriously y'all, they were amazing! Shannon's debut fabric line Dryad (which you can read more about here) is filled with awesome nature inspired prints and I was thrilled with the opportunity to work with her collection! If you follow me on instagram, I shared a sneak peak of my project on Monday. Below is the full reveal - the Arrowhead mini! Hope you enjoy it as much as I do. Thanks again Shannon for this opportunity. Your new line is beautiful! I was so excited with how it turned out that it's now a part of my gallery wall in the studio! Now for the giveaway details!! For a chance to win a bundle of Dryad, sign up to follow Fabri-Quilt’s blog, Inspired by Fabric and then leave a comment below letting me know that you are signed up. Entries will be open until midnight on Friday, Feb. 12, and the winner will be announced on Saturday, February 13. For those of you who wish to purchase the fabric now, Angela Walters is offering 10% off of Dryad fabrics from her shop, Quilting is My Therapy, during the hop using the promo code DRYAD. Please be sure to check out the other stops on the hop as well below!